On Friday afternoon the 26th, there will be a set of classes and a session, also followed by a Reception nearby. One class is given by Eric White, Curator of Rare Books, in Special Collections at Firestone Library, revealing “New Findings in Old Bindings”. Eric has agreed to repeat his class in 2 sittings, so as to allow more participants to attend, given the limit of 20 people for each class. 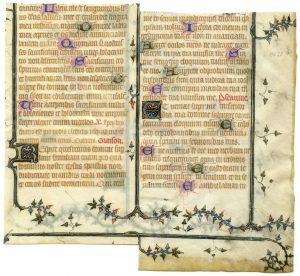 Another class, limited to 15 people, will take place over a selection of medieval and early modern manuscript fragments in the Princeton University Art Museum. To register for either class and the other events, please see below (Registration). On Saturday the 27th, a day’s sessions of papers and panels occur in 106 McCormick Hall, accompanied by breaks for coffee and lunch, and followed by a Reception at the Index of Medieval Art (also in McCormick Hall). This Reception will include displays of manuscript and early printed materials brought by participants from their own collections. Some of our earlier events have showcased such materials, for example in a Research Group seminar held in the same room at the Index: Manuscripts and Their Photographs . 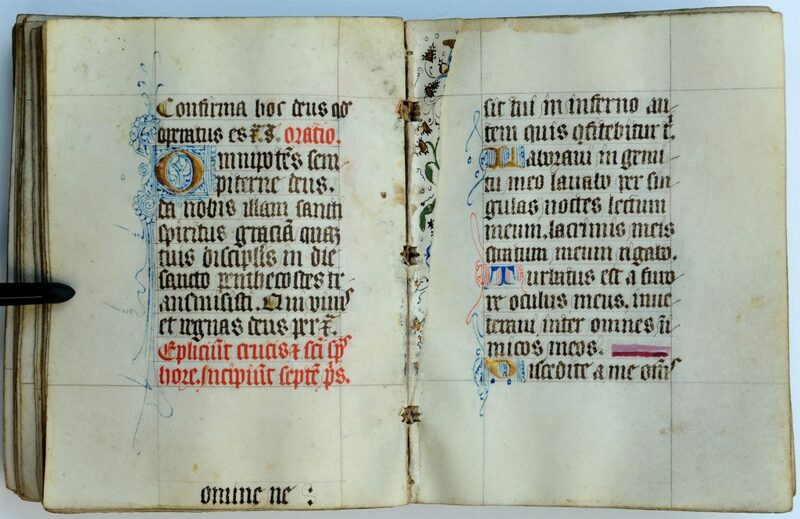 That same Book of Hours, opened to the (despoiled) opening of the 7 Penitential Psalms. 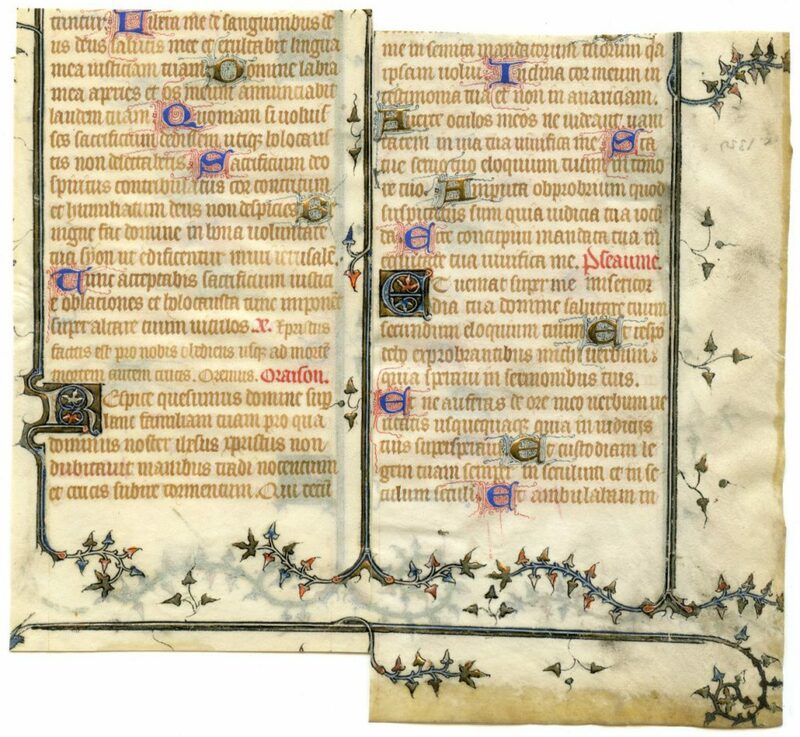 Folios 98 verso and 99 recto, with intervening stub from a decorated leaf. The present location of that despoiled leaf is unknown. Our 2019 Anniversary Symposium takes inspiration from its session organized by Barbara A. Shailor, showcasing case-studies at Yale University, on “The Peregrinations of Manuscripts: Origin, Provenance, or Both”. Our program and curated displays demonstrate myriad challenges and opportunities for assessing the origins, travels, and arrivals of manuscripts, documents, and rare books. The focus centers upon selected medieval and early modern materials, both Western and non-Western. We include reports of discoveries, work-in-progress, cumulative research, and collaborative projects. Attention to the essence of “Location, Location, Location” — involving stages in the history, present homes, and resource potential of the materials — may also consider choices made by scholars, teachers, curators, collectors, and bibliophiles in shaping their paths towards chosen fields of concentration, methods of approach, and regional and international collaborations. Considering “The Roads Taken” (obstacles included) by original materials in their patterns of production, use, collection, scholarship, and recognition, our event is designed to examine the nature of the evidence for locating the origins, travels, and homes of textual materials in diverse forms. Private Collection, reproduced by permission. On Friday 26 April, classes are offered as part of the Symposium. Attendance is limited, and requires registration (see below) for whichever you might prefer. Class given by Eric White, Curator of Rare Books, in the Large Classroom of Floor C (Special Collections) at Firestone Library. Limited to 20 participants, the class will be offered at 2 times. Class given by Mildred Budny in the Prints and Drawings Study Room of the Museum (entrance through the Staff Entrance). Limited to 15 participants, the class will be offered at only 1 time. To register for these classes, please see below (Registration). Descriptions about both classes will appear, with illustrations, in the Symposium Booklet (available at the Symposium and afterward on our website). A Reception will follow, from 5:00–7:00 pm at Proctor House, 53 University Place, Princeton. On Saturday 27 April, the Sessions of papers and discussions will take place from 9:00 am to 5:00 pm in Room 106, McCormick Hall, with coffee breaks and a break for lunch. Lunch is provided, but we ask for a nominal contribution to defray its expenses. The Symposium closes with a Reception hosted by the Index of Medieval Art from 5:00 to 7:00 pm. 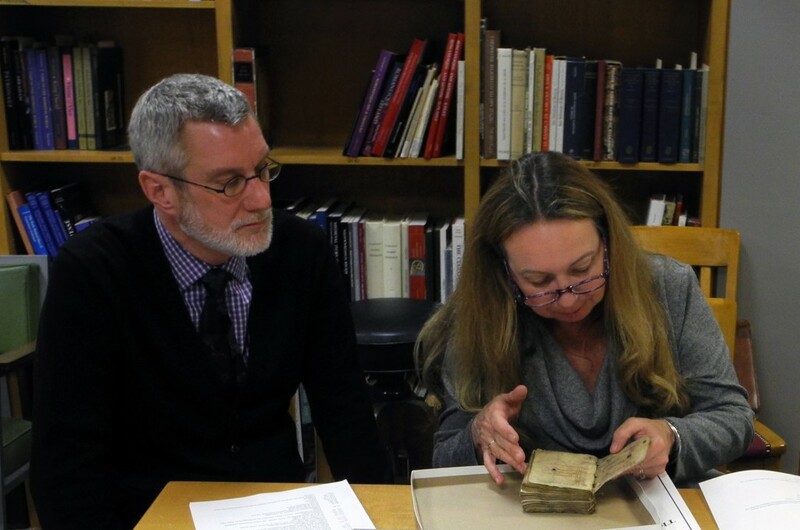 In its Seminar Room, there will be a Display of original manuscript and early-printed materials brought by participants from their individual or institutional collections. We ask you to register for the event, preferably ahead of time. Also, because space is limited in Special Collections and the University Art Museum for the classes on Friday, we ask you to sign up for them. It helps our preparations for refreshments (Reception, Coffee Breaks, and the like) to know how many of you wish to attend. We would ask for a nominal contribution of $12 for lunch on Saturday, so as to defray those expenses. The Registration Form is available as a downloadable pdf. 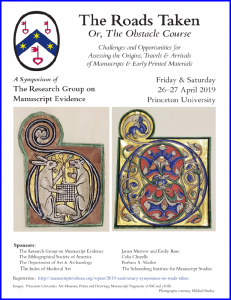 Please send the completed form to events@manuscriptevidence.org . or here otherwise (without PayPal). 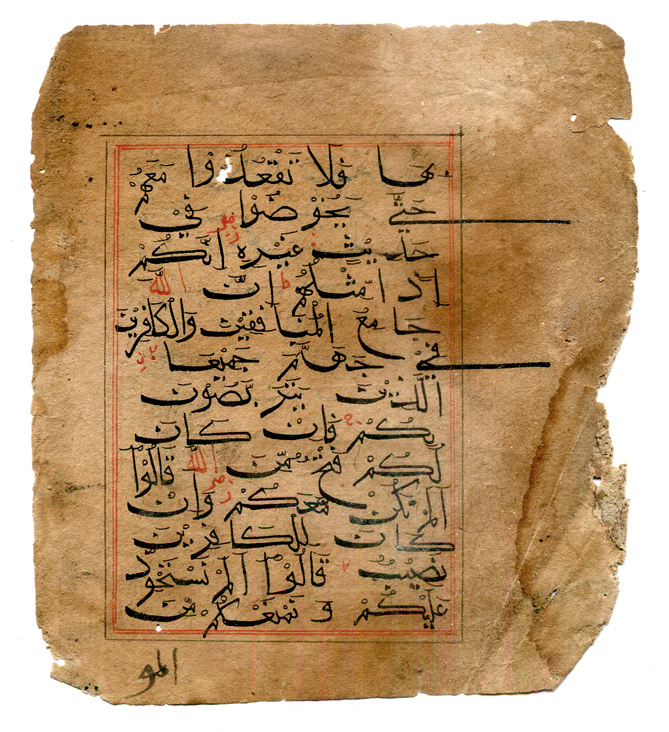 For any questions, please contact events@manuscriptevidence.org . Jessica Savage, curator of this exhibition at the Index, provides a description about it for the Symposium Program Booklet (available at the Symposium and afterward on our website). We thank our participants, hosts, sponsors, and supporters for their generosity in offering resources, expertise, time, and dedication to create the event. There is much to celebrate, as the Research Group enters a landmark anniversary year. Please join our celebrations. 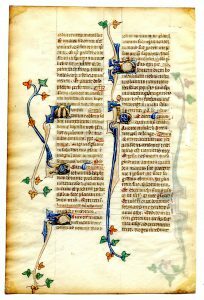 Rejoined Pieces of a Leaf from a Book of Hours. Private Collection. On display, by permission, at our Symposium. Please Contact us with questions and suggestions. 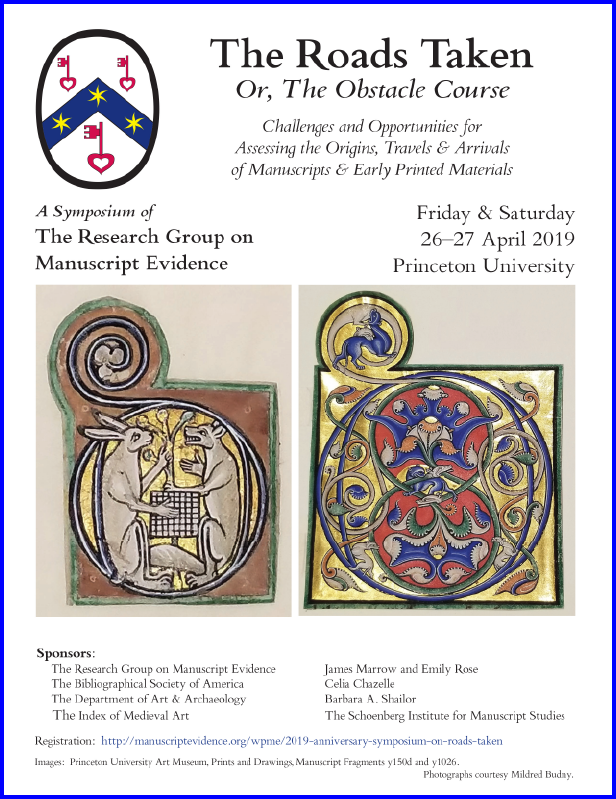 For Information, Registration, and RSVPs, please contact events@manuscriptevidence.org . Watch this space and visit our FaceBook Page for updates. We invite you to donate to our nonprofit educational mission. Donations may be tax-deductible. We welcome donations in funds and in kind: Contributions and Donations .